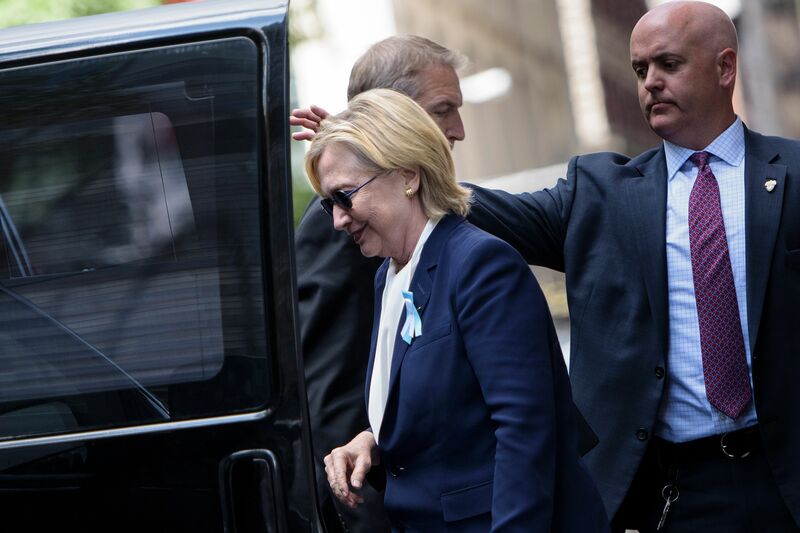 Hillary Clinton's pneumonia and the resulting early departure from the Sept. 11 memorial event Sunday wrap up a pretty awful week for the Democratic presidential nominee. The video of Clinton stumbling towards her ride while being held up by Secret Service agents was definitively the low point. Now, she has to take the medical conspiracy theories spread by Rudy Giuliani and his conservative blogging minions seriously. No opening pickle jars and laughing off the insinuations from here on out. But there were other unfortunate events since last Monday too. All in all, this has not been Hillary Clinton's week. Trump supporters have long pushed conspiracy theories about Clinton's health, and Sunday's episode was not the first to draw attention to the candidate's ability to serve this past week. A coughing fit should be just that, but when you're a woman running for president, be prepared for some to read a lot into it. She was at a rally on Labor Day when she broke into a coughing fit that just wouldn't end. "Every time I think about Trump, I get allergic," she interjected between intense coughs. Her voice never fully recovered, and by the next day she was facing questions about the conspiracy theories regarding her health. Then Tuesday came an election update her supporters could not have liked: her lead against Trump continues to shrink. FiveThirtyEight's Nate Silver explained just exactly what the state of the race is: Clinton's lead has shrunk from 8 percentage points to just 3, and Trump's chance of winning grew to about one-third. It's not as dire as some polls paint it — for example, a CNN poll showed Trump ahead by 2 percentage points among likely voters. That remains an anomaly, and Silver pays more attention to the general trends that can be seen. But any movement towards Trump is bad news for Clinton. On Wednesday, NBC's Matt Lauer happened. He led a live candidate's forum with military service members and veterans, but the critical consensus suggested he was not the greatest host. Donald Trump and Clinton each got thirty minutes to speak to military issues, but Lauer's line of questioning was quite distinct with each of the candidates. He kept interrupting Clinton, reminding her to keep it brief; with Trump he let the real estate mogul drone on without ever actually saying anything. This Commander-in-Chief Forum may be studied in years to come if just to see how not to interview candidates. Friday brought forth another cringeworthy moment from the campaign, with some even comparing it to Romney's "47 percent" moment. "You know, to just be grossly generalistic, you could put half of Trump's supporters into what I call the basket of deplorables, right?" Clinton said at a fundraiser in New York. She was referring to them as "racist, sexist, homophobic, xenophobic, Islamophobic" — all of which are arguably deplorable. But that didn't stop the GOP from twisting it. "Wow, Hillary Clinton was SO INSULTING to my supporters, millions of amazing, hard working people. I think it will cost her at the polls!" Trump wrote on Twitter. So you see, overheating was just the icing on a really awful cake. The past seven days will likely go down as her worst of this campaign, but there are signs that Clinton is well positioned going forward. The campaign released her pneumonia diagnosis, letting the world in on an illness she may see as private. Definitely looks like transparency. That's on top of her speaking to reporters on her plane Monday and giving a press conference Thursday morning and again on Friday. Showing she's the approachable, transparent candidate should help deflect most of Trump's attacks, and may just win her the White House.